Your big day is coming up soon, and there is lots of planning to do. At first glance, the budget looks astronomical! Is it possible to reduce your wedding budget? Look at the tips below. Take your wedding as a project that needs proper planning. Work out a rough budget and begin to save money early enough. Avoid getting into debt over wedding expenses. Remember, the money you sink into this big day is not recoverable. Don’t even think of using your credit card, or taking a loan. Attire – Don’t rush to buy the first wedding gown you see. Remember that this dress is worn only once. Hiring a dress would make more sense. Organization – Use people around you who are trustworthy and responsible. A team of dedicated people will help with your errands, and run the wedding day for you. Talents – If you have family members, who can cater, do décor or handle the music, ask them to do it for a friendly fee. Make sure you pay them, though. Transport – Don’t go hiring expensive cars. A few relatively new, clean and well-maintained cars from friends and family will work perfectly. Use fruits and vegetables that are in season for the meal. That way you reduce your costs, and the guests get to eat fresh food. If you can, buy all the ingredients yourself, hire a chef and a few waiters. Keep your menu simple and colorful. Flowers – The best flowers to use are those in season, as they last longer. Place your flower arrangements at points where they will attract the most attention. See what other options you have for décor that will fit into your color scheme, like dried flowers, paper lanterns, and many others. A delicious fruitcake to feed your guests will most likely mess your wedding budget. 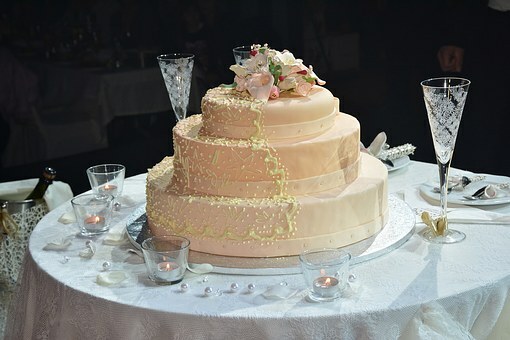 Opt for pre-cuts in classic flavors like vanilla or chocolate for the guests and a fruitcake for the couple and parents. This part of the wedding should be perfect. To save money here, work out a package with the service provider that entitles you to several photos and a video of the wedding, with the option of upgrading later. Hiring the services of a little-known but talented photographer is also a good idea. Consider hiring someone who works for a media house – they are just as good. With a little research, you can achieve the perfect bridal makeup. Use the internet to get ideas on how to do bridal makeup, and then find a makeup artist who can help create your desired look. Do a trial run to make sure the look works for you. There you go – eight ways to reduce your wedding budget! Now you can start planning!